For the last few months, I’ve been part of the YouView Humax DTR-T1000 beta testing; so unlike other reviews, this is an actual, proper hands-on review, complete with videos and images you simply won’t find on those other review sites that just rewrite press releases. This is a long one, so you’ll want to grab a beverage before reading. It’s been a hell of a ride for YouView to come to a stage where it’s finally been released and become available for sale on the shelves of most electronic retailers. The long journey has been brilliantly chronicled over at Wikipedia and it’s well worth a read if you want to know how YouView has progressed from conception to reality. What we have here is a twin DVB tuner (Freeview) PVR recorder, supporting HD and streaming on demand playback from our UK main broadcasters. 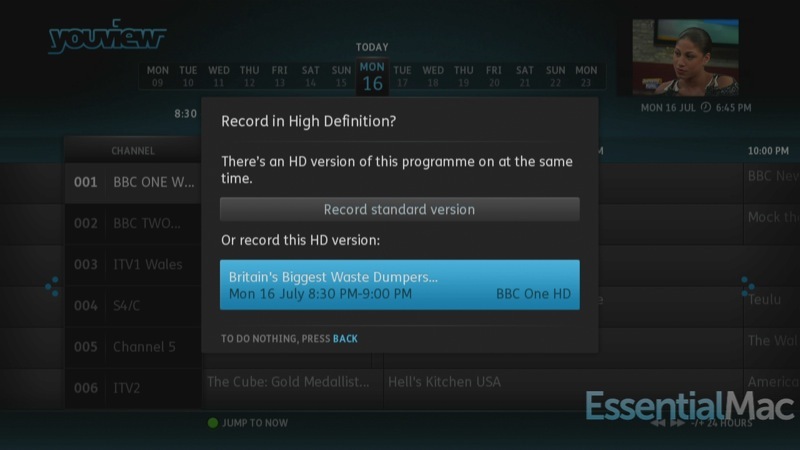 High-definition Freeview, red button services and 500GB of storage are provided, which nets you roughly 300 hours of standard definition or 125 hours of high-definition content (HDMI cable is provided). Wireless connectivity isn’t included, but what you do get is an option for two power line Ethernet cables, so you can connect to the Internet via power outlets in the house. You do pay a small £40 premium to get this with your YouView box, but I suppose it would remove any dodgy signal issues in a building. Connection-wise, on the back we have HDMI, Scart, RGB, RJ45, SpDif, RF and a USB port, so like most Freeview boxes of this ilk, you’re covered for connections. The actual housing on the YouView box is covered with a special type of fingermark-attracting finish, but a device like this is hardly going to be something you touch often. Looks-wise, it’s ok—not overly bad-looking, with the only main detractor being a retro-style VDF or vacuum style display (thanks Ezra) in orange. Thankfully it’s not bright enough be piercing like the Apple TV. That orange VFD display does scroll show information all the time, and there’s no way of disabling the scroll in any of the system preferences. Other reviews have mentioned that the small fan can make quite a bit of noise. Thankfully on my unit, there’s no complaining about noise levels. Starting up from cold comes in 2 minutes and 14 seconds with eco settings set to the default of high. Interestingly in the settings menu, there’s no medium option—just low or high. With the unit in power-saving mode, it’ll still record programs silently with only the orange glowing ring letting you know there’s still power going to it. You’ll find only two eco modes on the box at the time of writing: high and low. 16 watts could be seen as quite high. A Playstation 3 on idle is 1w, an Xbox 360 is 2w, and as soon as I have stats from Humax’s other offerings, I’ll have this post updated. Right; that’s the box covered. On to the remote. This remote control is a sign that perhaps development costs were slashed or they were simply looking for a way to save money on the project. Plus points include that the remote feels nicely weighted, SOME buttons have a nice feel to them and the remote has a logical layout. However, cheapness rears its head when you come to press certain buttons. It’s not easy to describe the sound of the buttons on rockers, but think of something like a dog training clicker. For a weighty remote button, presses feel hollow, with the clicks echoing / reverberating inside the remote. This isn’t the same for all the buttons—just the ones which are rocker based (volume up / down, channel up / down, etc). Interacting with the middle circle is the worst of all. Down presses seem to feel deeper than other buttons, and that silver circle is plastic—a special cheap, tatty style of plastic that you know will start flaking with prolonged usage. So close, yet so far from being a decent remote when you compare to a Microsoft or Sky style remote. Everything you need to do navigation-wise is click, clack, clack; it’s a noisy, intrusive experience that reaches an extremely annoying and distracting level. 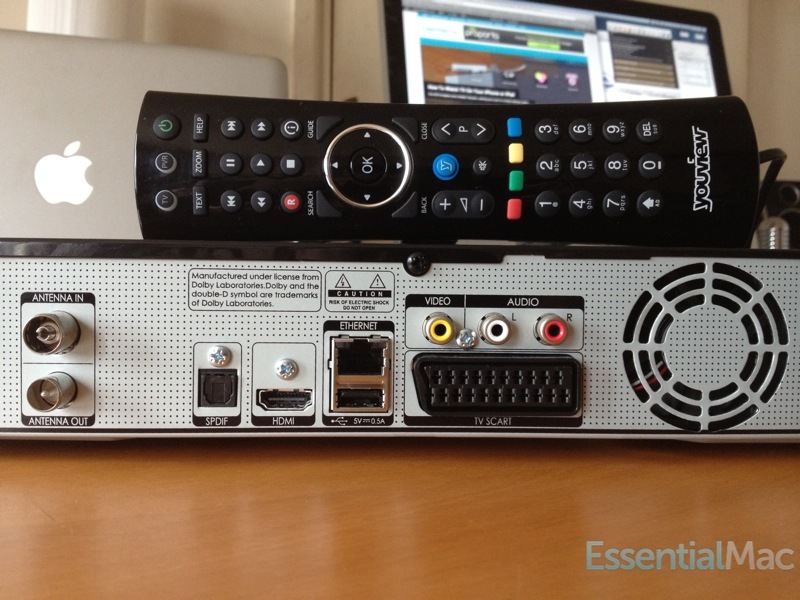 Want to use YouView whilst your partner is sleeping? Forget it; these buttons will wake anyone up. On the other hand, if you’d like to wake the neighbours, this remote is perfect. If anyone ever took a product and said “Put this thing out to tender, and let’s see what they come back with,” this is it. 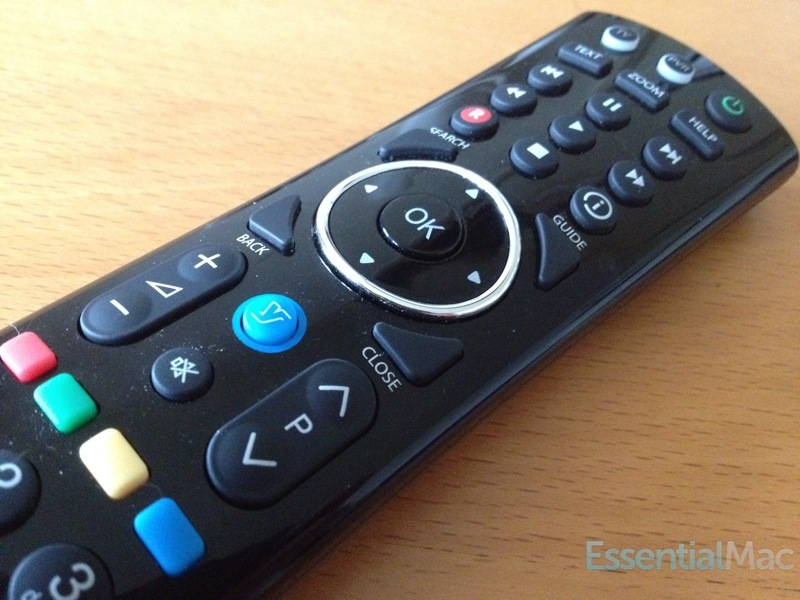 Even if you get used to the noise, there are remote control inconsistencies. I put this in the On Demand section so you can get a feel for how the remote changes depending on what you use and where. It’s a bit of a looker, this guide, working well on the whole 10ft menu basis. For those who are unfamiliar with that saying, the 10th interface is designed to be used when sitting on your sofa. Microsoft’s Media Centre set a high bar for this, and YouView nicely does its own take. During the beta phase, guide navigation included scrolling the guide around the bar, and not the other way around. The latest firmware update has brought back the more familiar interface. Despite a newer firmware update, if you attempt to scroll or navigate around too fast, you’ll be waiting for the screen to refresh and content to load. 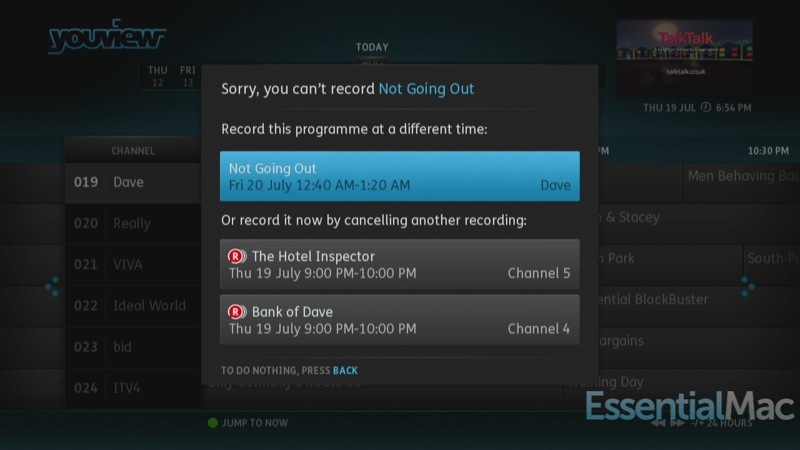 YouView EPG Guide Demo. on Vimeo. Jumping between sub-menus, you do see a small loading icon now and again whilst it’s pulling the content from the internal HDD. Perhaps the age of channel flicking is long dead, since the demise of analogue broadcasts in the UK and that lag when surfing content is a fair price to pay for more channels. Freeview boxes in general suffer from this; it’s not too bad, just not as responsive as, say, my fully fledged HTPC running Media centre (that cost just about the same amount of money). Be ready to wait again if you get overzealous on the key pressing whilst the system catches up. Looks-wise, it’s an improvement (in my opinion) over the best of them all, Windows Media Centre. I don’t understand why there’s “dumb text” like “To watch press ok.” Perhaps a bit of credit is due; not all of us are idiots. After all, if you understand TV on demand, iPlayer and Internet TV, then some on-screen clutter could be dispensed with. Hitting I on the remote on the guide gives you two tabs at the top: summary and details. If you were to compare this to Windows Media Centre, you’d find it lacking, as it doesn’t provide actors or a huge synopsis. But did many people really use that information? (update) A software update introduced the mini guide described below just after I wrote this. Looking ominous under set recording are those blank buttons that may one day find some usage. 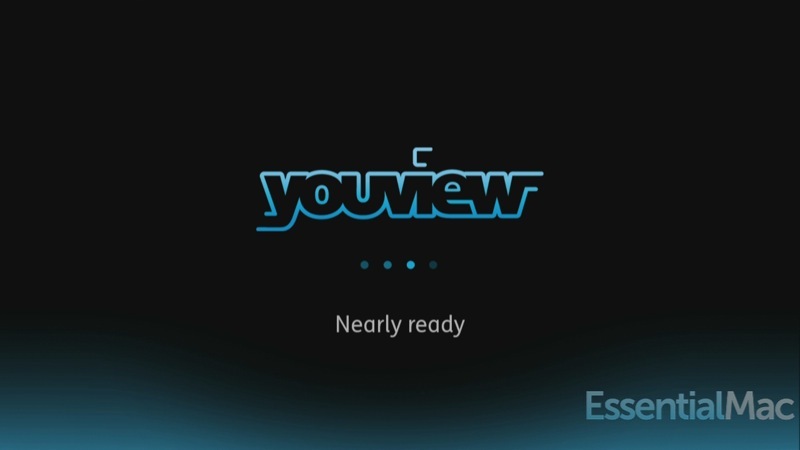 YouView’s guide lets you revisit the past. That’s handy if you just caught the tail-end of a show and want to schedule a repeat or an alert for the next time it comes on. Not only that, but if a program has On Demand Content, you can reach it via contextual menus. So if there’s been a show in the past and online content is available, you get to watch from that detailed tab. Getting back to the present is a simple case of pressing the green button whilst on the guide. Oddly enough, all the Top-UP TV channels are missing. I know this is no signal issue, as I can receive these channels on my other box just fine. Wonder why that is? There are issues with PayTV Channels in general, and that doesn’t include a simple omission of a Common Interface slot. Another nice guide feature is the promotion of HD channels. If a program is available in an HD counterpart, you’ll be prompted to choose between resolutions. You could argue that it’s another click that gets in the way, as after choosing HD or SD, you still need to choose between recording one showing or the whole series. Let’s just hope HD content stars coming along sooner than later. So those basic features of an EPG guide—like hiding channels or creating kid friendly favorites so you can hide / remove those channels—are bewilderingly missing. If you want to find a show for scheduling, watching, etc., the search won’t list guide content. Searching for content is an online-only thing. So if you want to search through the recordings without going back to the MyView screen, then you’re out of luck. What you do get is a rather nice sub-menu context display. In this example, entering GO with content still happily playing in the background populates a small bar based on predictions above the box. Think along the lines of predictive text on a phone—pressing up, clicking on search then seeing what online content there is available. It’s a nice unique touch, but why not include local content? As you can see, when there are two shows, navigating between the two uses a card shuffling effect, which is another nice garnish. Once you select the show, you’re taken to the on-demand stream instead of getting bounced to the provider’s on-demand page and then starting the searching process again. This is a nice feature that crept up on me; I wasn’t aware of it at all, as you don’t get things like this on an HTPC setup. On BBC Channels during a promotion for a program Book Me, this appears at the top left, bringing up the below dialogue options. Not All FreeView Channels Are Compatible. 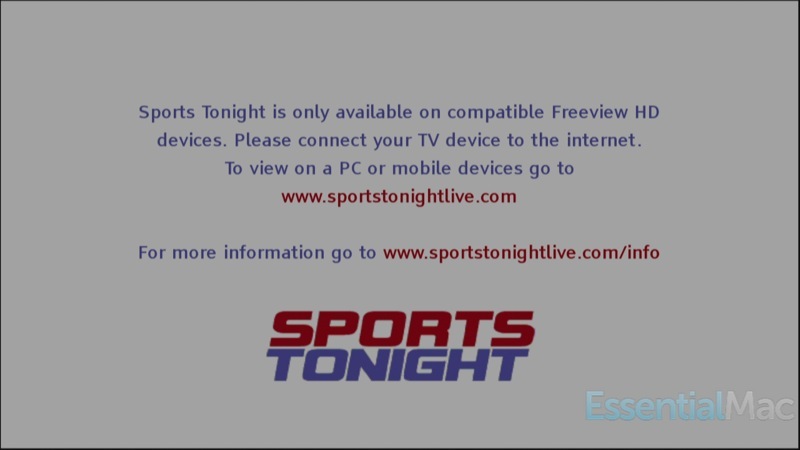 Like I said earlier, ESPN isn’t viewable at all, although you’re shown channel information for it in the guide. Trying to view ESPN rewards you with a blank screen. All PPV channels have the same effect. This criticism isn’t fully levelled at the YouView box, but it does goes to show how splintered Freeview in itself has become. Freeview + IPTV is a great idea (as YouView is demonstrating), but surely coming in at £299 all channels including at least the ability to watch ESPN should be available. Oh, and don’t confuse this with FreeView +, which is also another Freeview platform. 034 – ESPN: A lovely black screen greets you when you try to view. Ok, so those aren’t deal-breaking channels; however, this is a new box and surely should be supporting them from the get-go. The last thing anyone needs if they wanted these channels is yet another box. You could place the same argument about Freesat / Freeview / Sky, yet let’s not forget YouView is coming in at the top end of the price bracket. Recording a whole series doesn’t discriminate between a new showing and a repeat showing, to a certain extent. In one instance of recoding a series, a first airing was recorded. YouView skipped the repeats shown on time shifted (+1) channels on that day, but then recognised the repeat recordings on +1 channels on a different day and grabbed them as well. Conflicts are dealt with in the standard resolution dialogue, so thankfully, dual tuners minimise this. With those +1 channels for TV On Demand, you should be seeing this a lot less. Even if you miss a channel, then with the guide seeing the past, there’s a good chance of catching up on an on-demand offering. So finally we’ve navigated the menus, set up some recordings and now it’s time to finally kick back and watch some TV goodness from the armchair. Recorded programs are nestled within the MyView menu on the front end of the menu. It’s also been doubled on just how you get to recordings. Either press ok on the big MyView button or navigate upwards to get to the same place. It’s a feeling of a touch overdoing it; for one, the fewer key presses or removing the impression of having to do more work than is actually required to get to the same menu is always welcomed. Neat touches here include sorting by date, program name, watched or not watched as well as the ability to lock a program so you don’t poke out the tab like on old VHS tape to prevent deletion or recording. Locking a recording isn’t pin protected, meaning that anything recorded from “specialist” channels will be open viewing to all. A lot of Freeview PVR units share one thing in common: skip forward, fast, faster, faster forward and the same for rewind. For some reason, skipping functions aren’t available when watching a recorded program, but they are available when going On Demand. Again, other units have a tried and tested system: when you’ve reached the fastest point on the remote control, another button press takes you back to playing speed, so you don’t have to move your finger to get to that critical bit. It’s not a biggie, but when you are accustomed to something, anything different is just another thing to learn. Suddenly you end up needing to learn the remote for different areas of YouView. At the time of writing iPlayer, iTV Player, 40d and Five are available and just recently in the news Sky will bring their offerings to the Youview Platform. 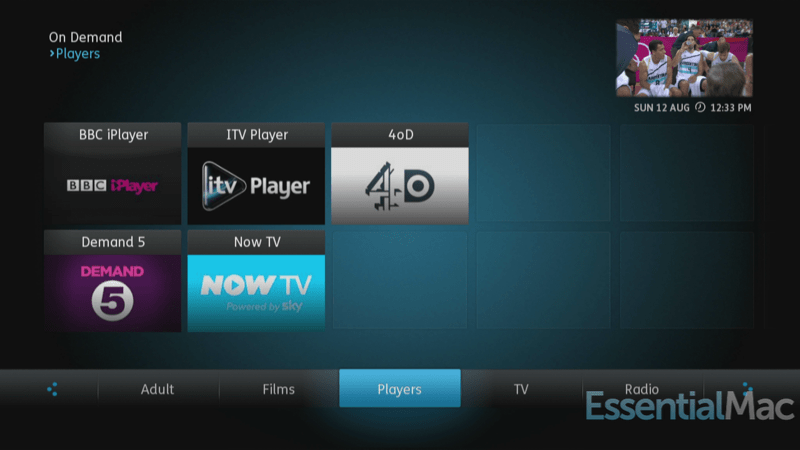 Sky Now joins the initial line up of iPlayer, iTV Player, 4OD and Five ( (Sky Now On YouView Review).. Right now there aren’t any more prospects who might join the YouView lineup, but you’d think that Netflix, LoveFilm or Film 4 could arrive sometime. Then again, Sky are known for bartering hard on licence agreements, so don’t expect them anytime soon. With my net connection running at 4mb or thereabouts (depending on the wind, position of the moon and generally how it feels), things are certainly smooth enough browsing through players and channels. Transitions and menu selections are fluid enough, but doesn’t feel like it’s a full 25fps experience at times. When the screen starts to get loaded up with graphics, there’s a touch of lag that gets introduced. It’s by no means off-putting, but it’s still noticeable, but not overly detracting. When you watch an On Demand or catch-up programme, your YouView box downloads the programme in advance so that it plays smoothly. I did reach out to ask how much is buffered, but received no reply. When you are viewing on demand content, there’s no buffering ahead like YouTube; so it’s buffering the start, but not from when you start watching. This makes sense if you imagine you paused to take a telephone call—buffering continues in HD, making the most of your Internet allowance. And as you can’t pick up from where you left off, all that downloading is for nothing. Yup, you read that right. If you’re halfway through a programme and need to drop out to do something else and want to continue from that point, that’s not going to happen. You must find the channel / programme, fast forward or skip to that point to continue. Pre Show Adverts For Programs Containing Adverts. Dear lord, iTV. If I’ve selected iTV player, watched your splash screen whilst loading, then selected a channel that’s clearly under a big logo stating iTV, please tell me why you are showing me more channel branding before running the adverts before letting me get on with what I wanted to do: watch something. It comes across as being insecure as a network. People have short attention spans as well as ever-decreasing patience, so putting all this fluff in the way makes it a challenge to get to content. Obviously the BBC is exempt from any advertising, yet I’m still irked with iTV. I should have known better when I did the roundup of TV-watching apps a while back. Channel surfing on demand content is as far away as they can make it. So you left that program and came back to watch it, but you’re near the end and want to skip to that part. Bad news again. If you skip to the third segment, you’ll still be watching those adverts you skipped past. 40d fares better on the user interface but rolls two minutes of advertising before you get to view a damn thing. Initially I thought, “Ok, that’s fair enough for new content, as people do have to make money,” yet it’s the same across the board. At least there’s no commercial interruption during programming. Lastly, Demand 5, the one I’ve dreaded viewing the most after my run in with the iOS app. Thankfully, Five On Demand surprised me with minimal pre-roll, instead sticking with un-skippable commercials. Adverts on streams are the price you pay for on demand content. You can see for yourself; here’s a few minutes of footage of me poking around in the iPlayer On Demand section. Please note that at the time of recording, my connection had been a bit flaky, so this may not be at full speed when loading tiles but scrolling movements are box dependant. Here we get to see the divide between online web / app-based offerings and YouView. Should you dive out of an online stream on BBC iPlayer, even if just back into the program selection menu and go back into the stream you were watching, you’ll be starting from the beginning. On the BBC iPlayer website / app, it’s intelligent enough to know where to pick up from. Thankfully, it’s possible to time skip 15 or 30 seconds at a time to get to the point you left from. Again, at the time of testing, all of the on demand apps suffered from forgetting where you left off and potentially where to pick up from. 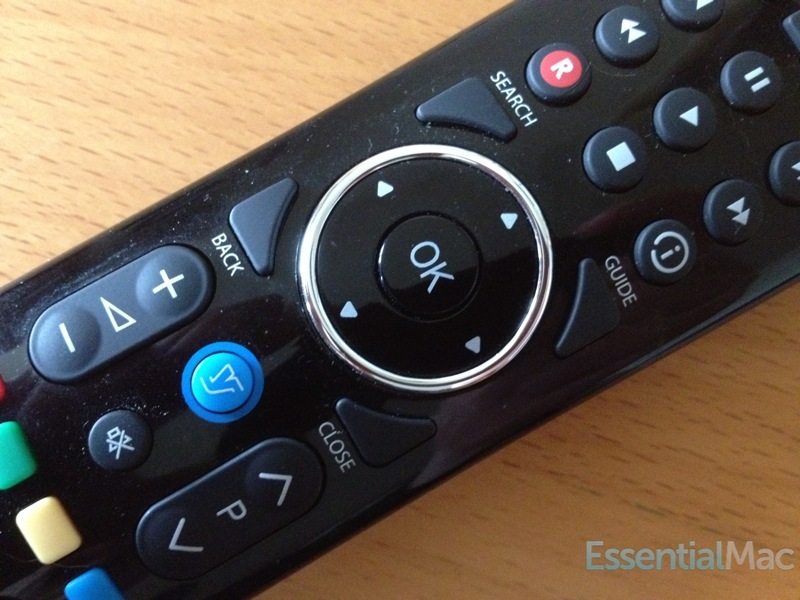 Each on demand channel uses the remote buttons a different way. BBC iPlayer does the 15- or 30-second skip (covered below), which is just fine, given that the YouView hardware lags behind a touch at times. 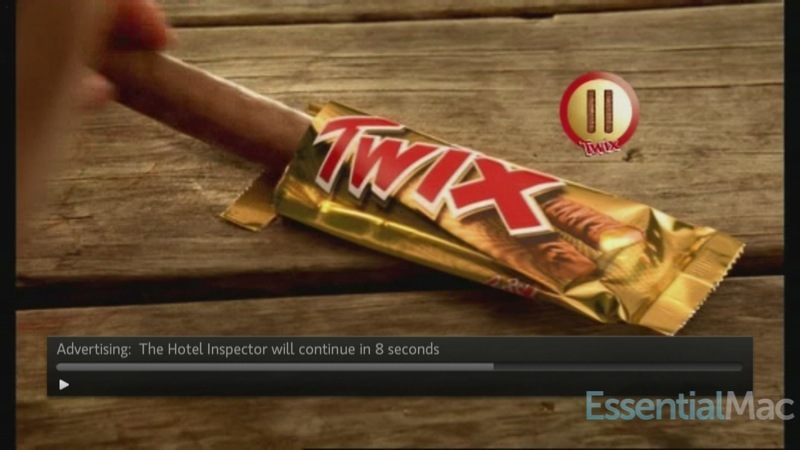 Head into iTV iPlayer, and suddenly the buttons become true fast forward. On almost all remotes, pressing once makes it go faster, another tap faster still, another tap it’s flat out and then one more takes you to normal play speed. It’s understandable that different online platforms would choose to use buttons in a similar but different way, yet if it were more consistent, the overall experience would be greatly improved. After all, different functions do mean learning something new for every online player—and then a different control set when playing back locally recorded programs. Final thoughts: you seem to have to learn the remote control for each application, as it’s not used in a consistent way throughout the device. Different buttons doing different things is fine in a console game, but I don’t think it translates well into the TV realm. Others might see things differently, but with a game, you play and become accustomed to controls, etc. Of course it would be too much to ask for a consistent user interface and navigation control style; remote control inconsistencies may be slightly annoying, but they’re nothing really insurmountable when it comes to the main task of watching catch-up TV. Bringing all these companies together in one environment is no small feat, and so a congratulations must go to YouView for finally achieving what they set out to do all those years ago. There are a lot of neat touches, and for me, being able to see catch-up programmes in the guide and being able to go to those shows is a huge plus. That’s a neat touch—but we still have to come back to the different navigation styles. This is a much better environment for catching up with programmes I haven’t recorded as opposed to sitting in front of my computer or staring at the small screen of my iPad. Speed, latency and responsiveness of streaming verges on the great, and they’ve never once incurred my wrath of impatience. So you might be thinking to yourself, “For £299, I can roll my own media center, and I could get a lot more functionality, like playing videos from my network, etc.” You’re right; you could do more, but at the cost of a lot of effort. Plus, Windows 8 isn’t coming with media centre out of the box. In some respects, another competitor is the Apple TV. It doesn’t offer catch-up services or live TV (so far), but it does offer rentals, music, radio, etc. Presentation. Colors are good, layout is just about right—so why not get transitions running smoothly? That’s the thing that everyone with a half decent pocket-sized bit of technology is used to, so why some slides, transitions and fades are jerkier than an underpowered PC leaves me bewildered. It’s another area of lag that detracts points from the score. All the little things mount up to tarnish the YouView idea. A future for YouView? I do have slight reservations about the future of this system. We’ve all heard similar promises and hoped for something comparable with Windows Media Centre, but they were never fulfilled; initial offerings were left to fester, never being improved upon. 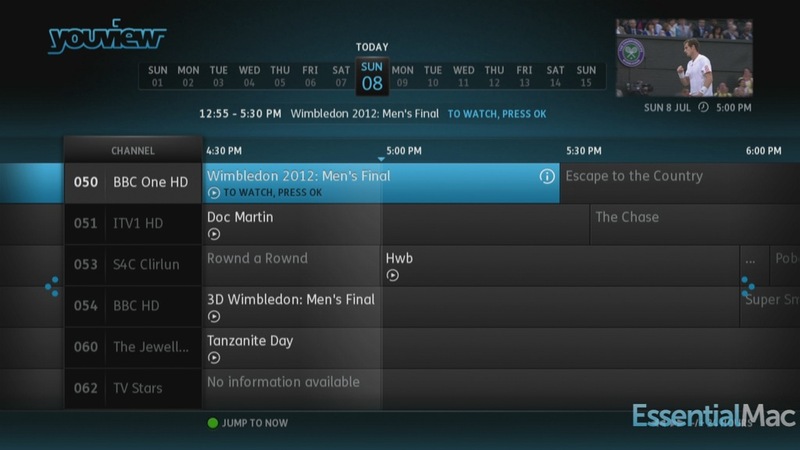 Back in March 2011, YouView released their API documentation (broadbandtvnews), but there’s already talk of Android powered set to boxes, which opens up a whole new era of PVR + other stuff possible on the TV set. Humax, who is behind the YouView box, is also betting on Android as a future platform. Sky Now has arrived on the platform, and that’s a big win, even if it is slightly costly and could potentially put off the LoveFilm and Netflix brigade. Check With Your ISP Before Purchasing. The last piece of the puzzle lies with the Internet service providers. At the moment, on the 40GB service that I have, I was able to max it out with only a few hours of watching on demand TV a day. For those of you on cheap broadband packages, be very careful. Looking through Sky Now, they say 10 minutes of viewing = 110mb. That’s a pretty good all-around figure. Round it off to about a 90-minute film, and you’ll be grabbing about 900mb (variable bit rate). Easy to see how some broadband packages just aren’t going to work here. Both launch partners British Telecom and Talk Talk are well renowned for offering cut price broadband, and that’s where I see a potential flaw. Both promote low-cost “get online” packages, but 10GB really isn’t much when it comes to streaming. And once you max out your allowance, extra usage comes at a premium. If I were a conspiracy theorist type, I’d say perhaps that’s where they claw some money back from these charges. There is an awful lot to like about this product; everything comes together in a common sense style, even if some of the navigation choices are a little suspect. Setup goes without a breeze, with the dual tuners doing a great job of picking up channels available in my area—even going through a booster that I have to use. Some tweaking is still needed on the UI side of things. Some areas just lack that smooth transition which we come to expect in this iPhone era. None of those fancy UI elements is bad per se, but you know it’s not quite…there at times. However, after several weeks of testing, that darn remote is now driving me mad. It’s absurdly clicky and clackey, and using the main navigation wheel is a stiff chore. That ring around the directional buttons just doesn’t add anything to the experience. But that noise…arggh, there really is no “getting used to it”! It might pass the WAF (wife acceptance factor), but you end up not wanting to touch the remote for when the dog starts barking. I’m all for noise and tactile feedback, BUT only when done discretely. This is probably one of the longest reviews I’ve ever done. If you’ve made it this far, thank you very much for reading to the end. A new padlock symbol to help identify which of your recordings are locked to prevent automatic deletion. A message to remind you that if you have pressed the TV button on your Humax remote control, you will need to press the PVR button to continue using YouView. New software for the YouView Humax box is now available for Retail and BT customers, the software will be available on YouView TalkTalk boxes shortly afterwards. The YouView app available for Apple devices (iOS 5 or later), provides you what’s on TV and radio over the next 7 days, provides additional programme information and lets you record a show while on the move. A software update for the YouView Huawei box from TalkTalk will begin on Wednesday 12 th December between 2am – 3am. To find out more Click here and this will then enable access to the YouView App. We are looking to develop versions of the YouView App to be compatible with other mobile device operating systems in the future, e.g. android phones. If your box is connected to the Internet and has not been switched off either at the plug socket or via the switch on the back of the box then the update will be automatically downloaded overnight. 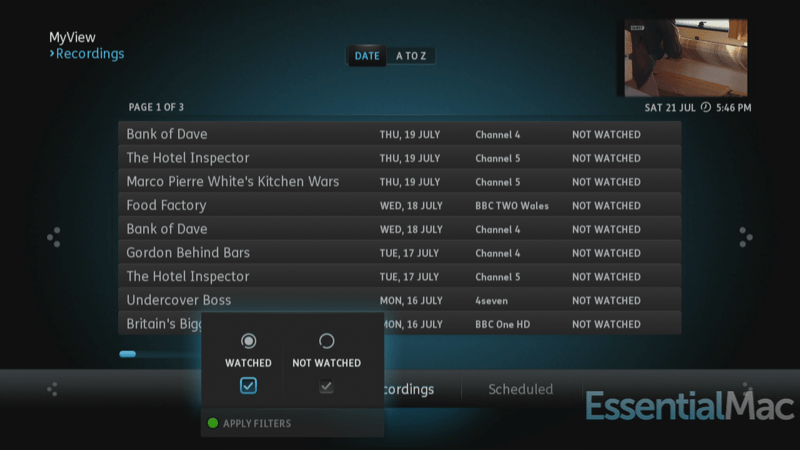 You can check if you have the latest version by pressing the YouView button on your remote control, navigate to Settings > System Information > Software Versions. The introduction of Live TV content into the Search Function. Support for Dolby surround sound over HDMI. You will be able to enable surround sound over the HDMI connecter through a new setting. Addition of an HDMI setting to allow you to address problems that some TV sets may encounter when connecting via HDMI. The HDMI Display Setting (under TV Signal & Quality) allows you to set an output preference of 1080p, 1080i, or 720p. The introduction of a new setting to enable a recording deletion confirmation message. This setting enables a confirmation message whenever you try to delete a recording in MyView. To enable this, go to Settings > Device Management > Delete Recordings Confirmation and choose ON. (The default is OFF). An improvement to the Audio description volume level when viewing HD channels. A fix to correct the box time from being reset to 1 st Jan 2000 until the box is next restarted. This release resolves a possible scenario where some boxes may lose network settings or fail to enter maintenance mode. Mark (reviewer). Have you thought of writing in English, with some punctuation? Or perhaps you could read through and check your writing before publishing? An informative article, spoiled by being difficult to read.